Back in 2009 I wrote a piece for the magazine about marijuana legalization. One of the things I learned is that a key question about the effect of legalization is whether marijuana and alcohol are substitutes or complements. If alcohol and marijuana are substitutes, it means that higher sales of marijuana will likely produce lower sales of alcohol. This would, generally speaking, be a good thing, since marijuana smoking is less hazardous than alcohol on multiple levels: It does less physiological damage to the imbiber and less damage to others (drunks tend to get mean while smokers tend to get stoned). However, if alcohol and marijuana are complements, then higher sales of marijuana are likely to lead to higher sales of alcohol too. There would be nothing good about this. We find that marijuana and alcohol are strong substitutes. Counties located in MML states reduced monthly alcohol sales by 15 percent, which is a consistent finding across several empirical specifications. When disaggregating by beer and wine we find that legalization of medical marijuana had a negative effect on corresponding sales by as much as 13.8 and 16.2 percent, respectively. The authors also measured sales of alcohol in border counties. 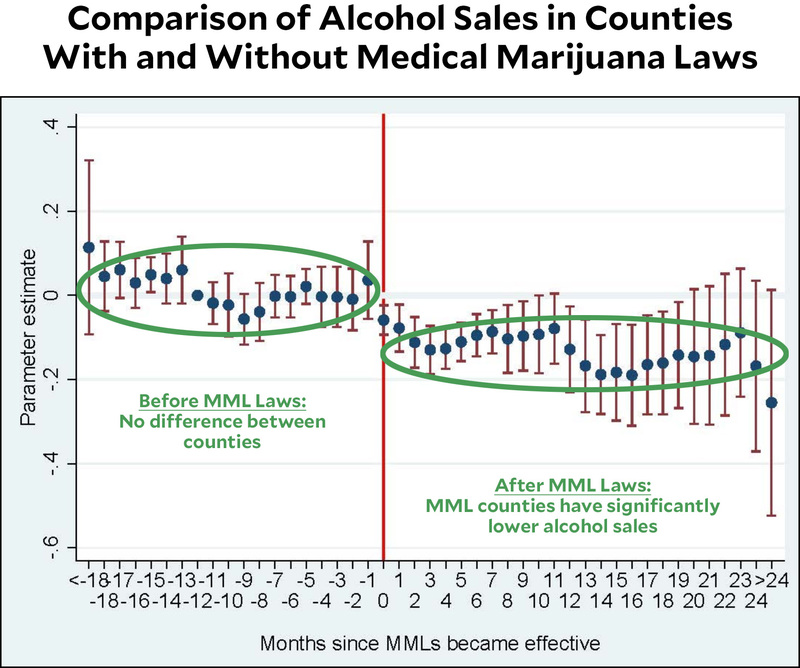 The effect was the same: after medical marijuana laws were enacted, counties in MML states had lower alcohol sales than counties across the state border. There are a few caveats here. First, it’s based on scanner data, but not all alcohol is sold in stores. Second, as usual for studies like this, the authors control for a wide range of things: “county economic conditions such as unemployment rate and median household income…total population, percentage of male and Hispanic population, and the share of population by age groups.” Is that enough? Is it too much? It’s always hard to tell. There’s more to marijuana than just this, but it’s nonetheless positive news. If it holds up, it’s yet another reason that legalizing marijuana is, on net, probably a good thing.